This wax model depicts in miniature how the life-size bronze version will appear when it is installed later this fall along the downtown Eastport shore walk. Sculptor Richard Klyver protects himself from the intense heat as he pours molten bronze into a mold at the foundry in his Eastport studio. The Eastport mermaid is being cast in bronze in eight sections that will be welded together before finishing and installation along the downtown Eastport waterfront. Sculptor Richard Klyver of Eastport (left) and fellow artist Ken Waiwood of St. Andrews, New Brunswick, pour molten bronze into a mold of one of the anatomical components of the Eastport mermaid. EASTPORT, Maine — Piece by piece, downtown Eastport’s shore-walk mermaid is slowly coming to life. The bronze beauty is a work in progress at the foundry in the studio of Eastport sculptor Richard Klyver, who was recently commissioned to create a life-size mermaid inspired by the iconic “Little Mermaid” statue that since 1913 has attracted countless millions of admirers to her rocky harbor perch in Copenhagen, Denmark. Klyver fired up his Prince Avenue foundry last week to pour the seventh of eight elements of the sculpture, which he hopes to install on Eastport’s downtown waterfront before winter sets in. 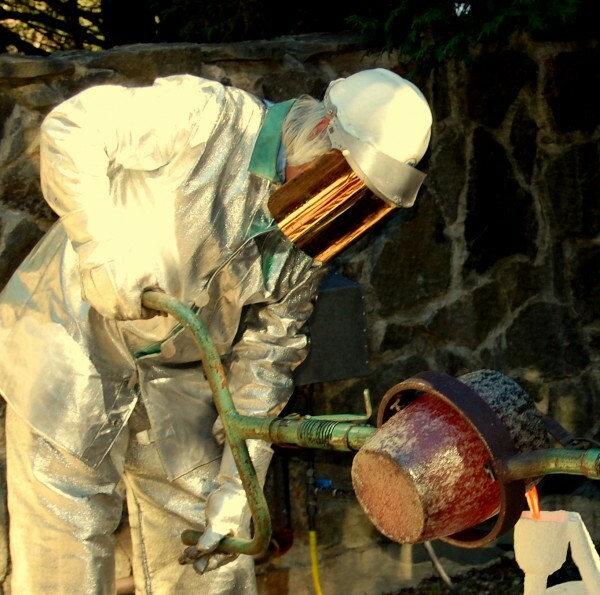 Last week’s pour required bronze ingots to be melted down into a 2,100-degrees-Fahrenheit molten sludge before being carefully poured into a mold created by Klyver. 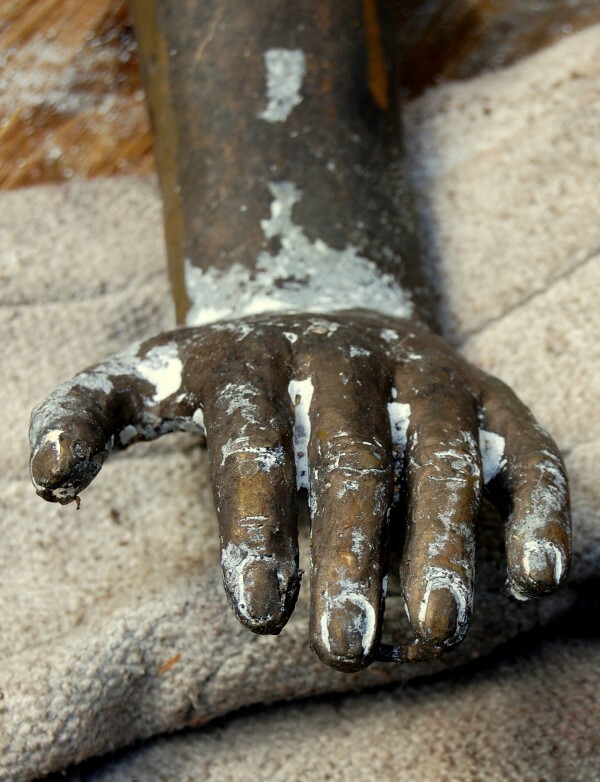 The mold itself was built through a multistep process that begins with a wax rendering of each piece to be cast into bronze. 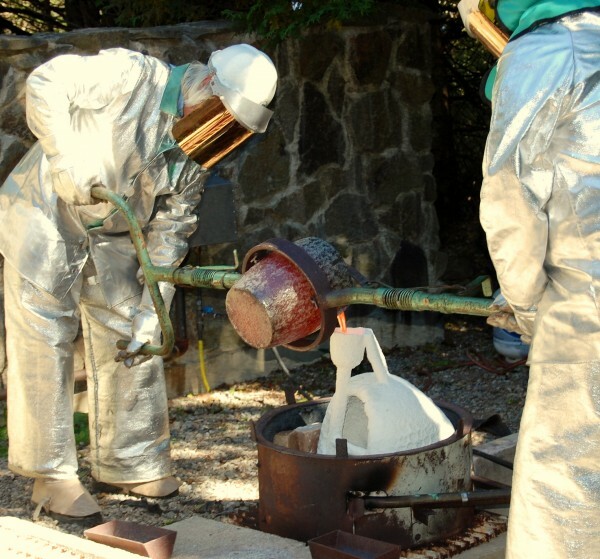 There are two dueling, gas-fired components to Klyver’s outdoor foundry, one rendering the bronze to a viscous state, the other bringing the mold to 1,500 degrees. The most recent pour yielded Goldilocks results: Two hours into the process, the bronze was too cold. Twenty minutes later it was too hot. Finally, the temperature of the molten bronze was just right, and the pour went off without a hitch, celebrated by the cheers of those watching from the sidelines. After the final element is cast, all eight anatomical components of the mermaid will be welded together and worked by Klyver into a gleaming finish before being installed on a polished stone base. The project has received the blessing of both the committee that oversees Eastport’s downtown historic district and the city council, although it was not without controversy when considered by the council, as mermaids — except for the Walt Disney version — are bare-breasted. How many hours does Klyver have into the mermaid commission already? Eastport’s mermaid was commissioned by George and Sarah Kurzon and Hugh and Edie Stubbins. The Kurzons are summer residents of Eastport, while the Stubbins summer in Pembroke. Kurzon said he was delighted to have an artist of Klyver’s caliber take on the project. 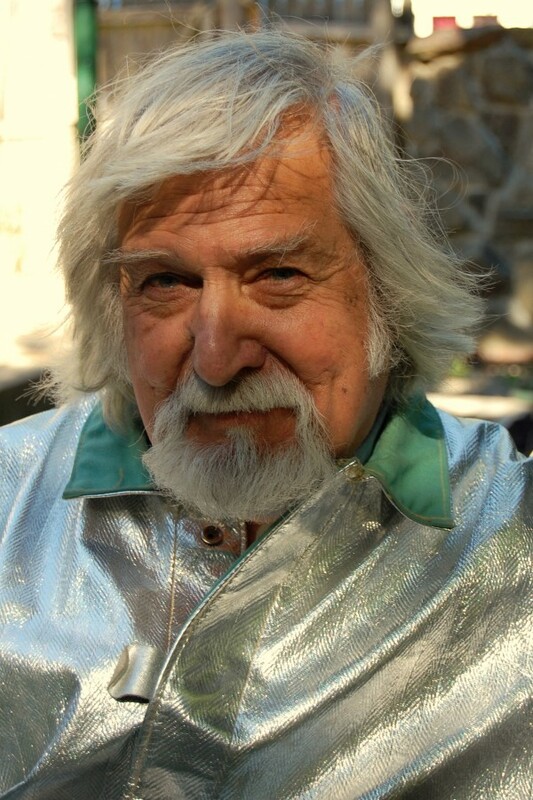 A native of Long Island, Klyver first came to Eastport in 1974. Now 72, his work as a sculptor largely reflects his travels, including years spent in Africa teaching art and geography in Kenya. His cluttered studio is a menagerie of sculpted beasts, some in wax, others in bronze, ranging from water buffalo and giraffes to lions and wildebeests. His creations include life-size bronzes as small as a dragonfly and as large as a one-ton replica of a triceratops dinosaur skull on exhibit outside the Smithsonian Institution’s Museum of Natural History on The Mall in Washington, D.C.
Klyver is currently working on a bronze depicting the alewives that migrate up Maine’s rivers and streams. He’s also working on a kinetic fish sculpture constructed of elements that resemble leaves, an outdoor piece that will shape-shift with the winds. Locally, Klyver’s work is on exhibit — and for sale — at the Asticou Connection gallery on Mount Desert Island and at The Commons gallery on Water Street in downtown Eastport. In addition to his studio work, Klyver teaches art one hour a day at Shead Memorial High School in Eastport.